I usually wait until a project is complete to blog about it so I thought I would start writing about some while in progress. I was commissioned by a friend to make a crochet edge flannel baby blanket that will be given in a baby shower gift. The first time I saw this type of blanket here at Purl Bee I was amazed at how beautiful it turned out. 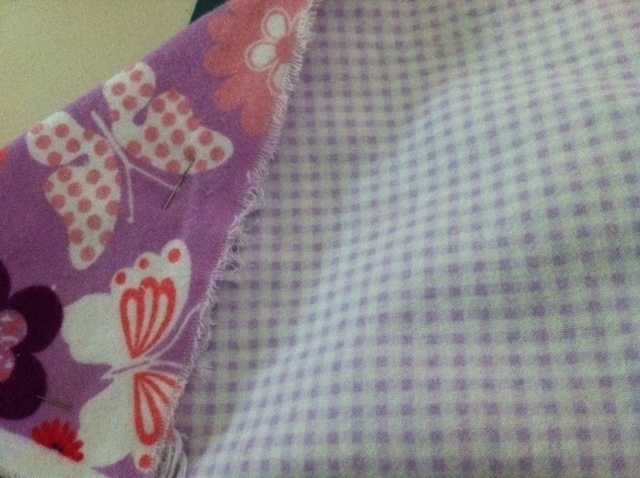 This one was different from others I had made in that she asked 2 fabrics be used instead of just 1 flannel. 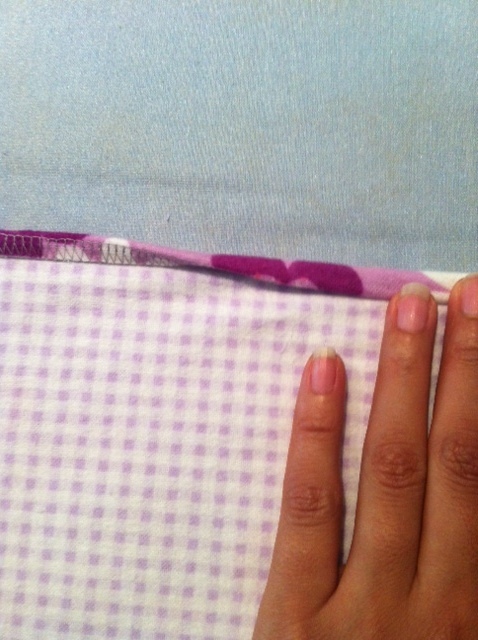 Using 2 fabrics together made the blanket reversible and thicker than a regular receiving blanket. I just had to figure out how to best join the 2 together. One of the first steps for me when working with baby fabrics is pre-washing. Not only is it important to launder for shrinkage but also allows the items to be used right away instead of burdening a new mom with washing a new item. Here are both fabrics (1 yard each) washed and ironed. 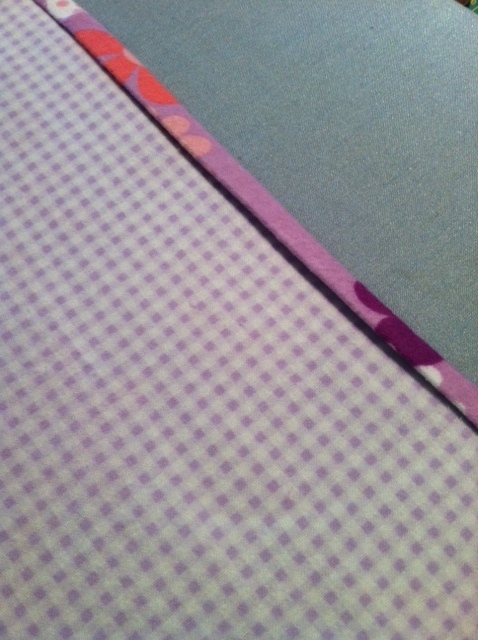 These complimentary prints in shades of purple make a pretty blanket for a little girl. 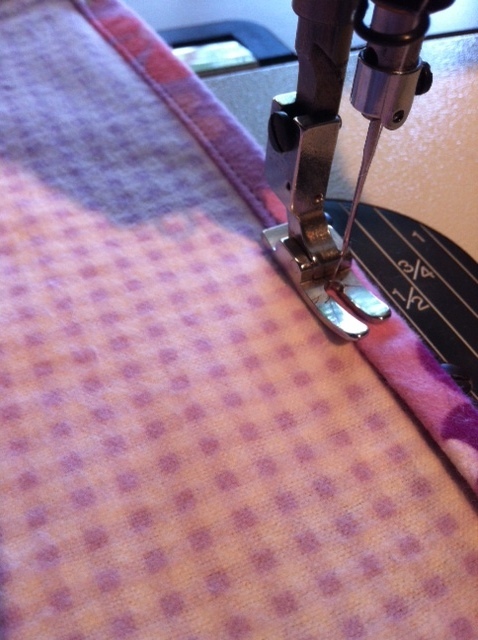 I decided instead of joining the two with a straight stitch to use my overlock machine and serge around. 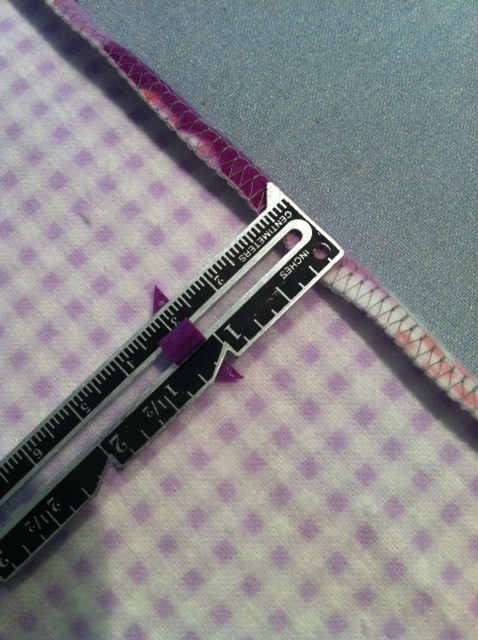 This made it easy to take care of the frayed flannel edges and join the 2 seamlessly. 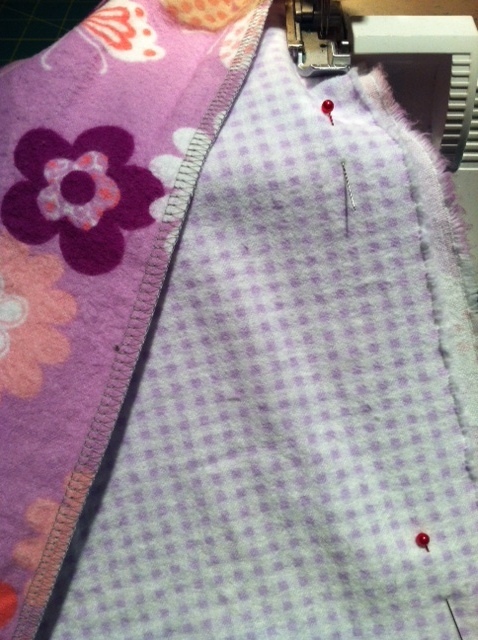 I did use a lot of pins to keep the fabrics lined up and to avoid any ‘bubbles’ from forming. Looks like this once the edges are all nicely ironed down. This step is probably not necessary but I really like the crisp and clean look it gives the blanket edging. Now it was time for a quick strait stitch over the top. This would make a great blanket at this stage but I love adding the crochet edge to make it special. What I love the most is that I don’t have to crochet an entire blanket! 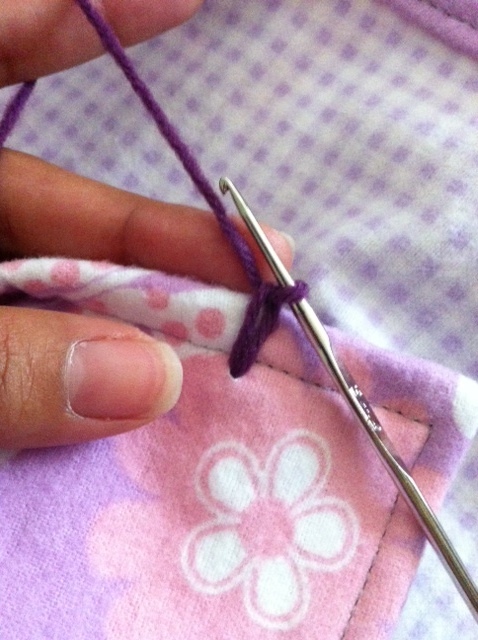 It’s the convenience of sewing with fabric while still being able to add a crochet touch. Flannel receiving blankets are very popular for new babies and are also great for warmer months. 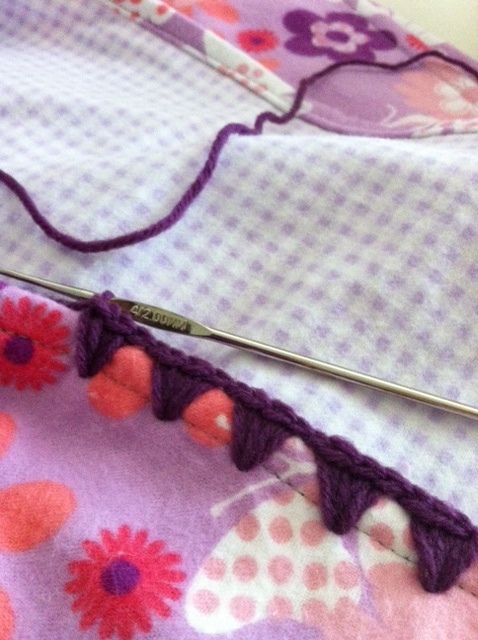 Part 2 of this project is adding the crochet edge. 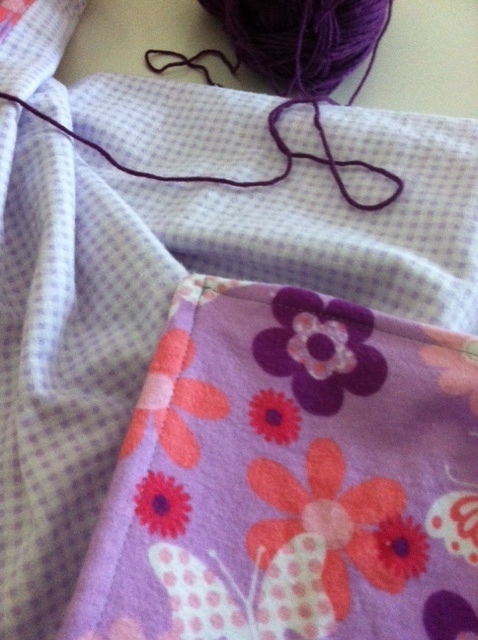 I had the perfect plum-colored yarn to match the shades of purple in the print. 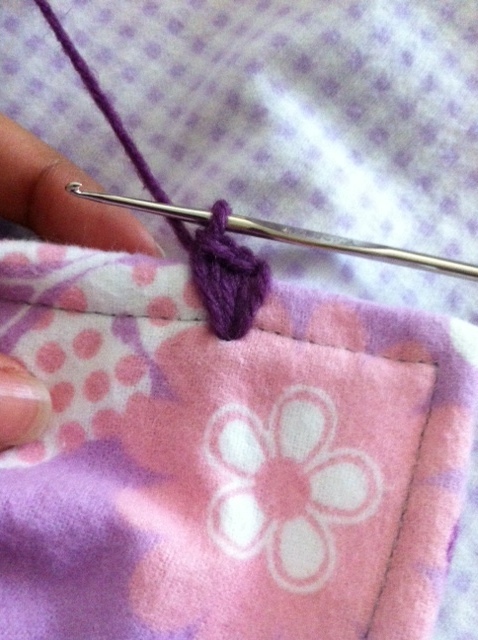 I find that using a size 3 (light) yarn or even a 2 (fine) works best. Crochet thread could also be used. I just make sure I am using something that is baby friendly, soft, and washable. 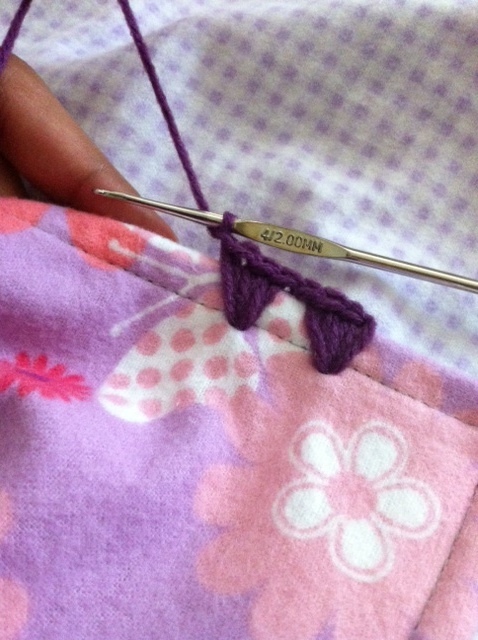 There are a few methods to do an edging on any blanket. Ranging from fancy gadgets that punch holes in fabric as it rolls over, to using an exacto knife to slice thru. I go simple and old school. I don’t have a special “sharp” hook but I found that my size 4/2.00 steel hook has a sharp enough end that it punches thru flannel fabric. 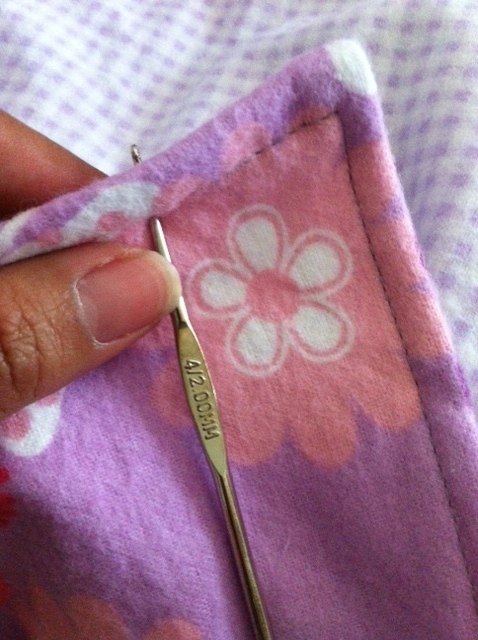 This time, the 2 layers of fabric proved to be a little tougher but with a little muscle, the hook went thru every time. I started about 1.5 inches from an edge. After “punching” thru both layers of fabric, I started with my yarn. 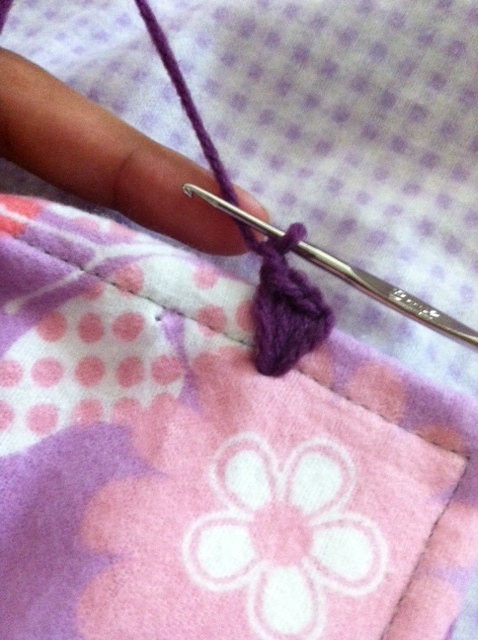 2 more single crochets in same stitch, making a cluster of 3 single crochets in same space. I started the next cluster of single crochets about 1/2 inch apart from the other. I could have easily marked these spaces beforehand with chalk or another washable marker, but instead I chose to eyeball it. I recommend marking the spaces if you are not yet comfortable with estimating the distance. Enough of these beauties has given me enough practice to estimate. Isn’t it better than just leaving the blanket plain? This is a fairly quick project to make up. The edging can take 1-2 hours, depending on interruptions. In the crochet world, that’s a fast project! I will be turning this blanket over later this week and am reminded how much I love making these. I am making one of these for a good friend. They are adorable! Do you have a picture of the finished blanket? Thank you! So glad you are making one. Unfortunately I dont have a photo is that blanket finished. But I do have photos of a similar one from a previous post I did in gray and yellow that turned out beautifully!